We're launching the Ghost Works Survey, and you can help. 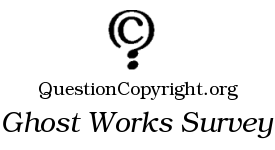 The Ghost Works Survey is a project to investigate how often, and in what ways, copyright prevents artists from making new derivative works. In the article "Seen Any Ghost Works Lately? ", we defined a ghost work as a creative work that never got made, or was made but not released, because copyright concerns prevented it from being started or from being distributed. Since then, informal conversations with artists, publishers and others have made it very clear that such suppression is a common event, much more common than most people think. But the public rarely hears about it, because no one does publicity for a work that doesn't exist. The purpose of the Ghost Works Survey is twofold: to demonstrate the scope and scale of this phenomenon by gathering and organizing as much data about it as we can, and to highlight compelling individual stories of artists and other creators who had their work thwarted by copyright restrictions. The survey will not attempt to catalogue every ghost work — there are likely far too many, given that almost every artist we've talked to so far has a story of a work they had to alter or lay aside due to copyright concerns. Rather, we'll focus on qualitative results: we want to collect enough stories to discern large-scale patterns, so we can understand and publicize the effects of copyright suppression. For more information, see the projects page. The time commitment will only be as great as you want it to be — we'll need help with tasks both large and small. Since much of the project involves receiving and processing stories from artists, our capacity is directly proportional to the number of volunteers: the more people are involved, the more we can do! QuestionCopyright.org can provide technical infrastructure and planning, but there is no substitute for human minds. We'll also need some volunteers willing to take on specific responsibilities: for example, a maintainer for a MySpace page and a maintainer for a Facebook page (because we need to make it as easy as possible for people to send us stories). And we welcome ideas, of course — please leave suggestions as comments on this article. Talking on Copyright at ApacheCon EU in Amsterdam, April 9th. If you're in or near Amsterdam in the second week of April, come on over to ApacheCon EU, the 2008 European conference of the Apache Software Foundation. There are a lot of interesting speakers and sessions going on, not all of them technical (for example, "Open Source Business in Europe" by Arje Cahn). I'll be giving a talk entitled Creation Myths: Three Centuries of Open Source and Copyright, on Wednesday, 9 April, at 5:30pm. It's about the similarities between today's open source movement and the creative world of the pre-copyright era, how copyright and centralized distribution gradually changed the nature of creativity, and how open source and decentralized distribution are changing it back again — but with some new twists. (This is an updated version of a talk I gave last summer at OSS2007 in Ireland.) We'll also look at some non-software business models based on unrestricted information flow and collaboration. Slides are here: OpenOffice.org (ODP), Adobe PDF, Microsoft PowerPoint (PPT). Read more about Talking on Copyright at ApacheCon EU in Amsterdam, April 9th. I've known about the terms "copyright" and "trademark" for as long as I've been able to read cereal boxes at the breakfast table. But I didn't became aware of copyright and the surrounding issues until I was in college. Sadly, our introduction wasn't all handshakes and smiles. I play the guitar. I started teaching myself how to do this in high school, when my primary taste in music was so-called Christian rock. I carried my interest in the guitar with me into college at the University of North Carolina at Charlotte, where I developed a second love affair – with the Internet. At some point early in my college days, someone introduced me to OLGA, the Online Guitar Archive. OLGA had the straightforward goal of providing a single location where guitarists of all shapes and sizes could download and contribute plaintext files that described how to play particular pieces of classical or popular music on the guitar. I gathered while traipsing around through newsgroups and such that OLGA was pretty popular with amateur guitarists like myself. There was only one small problem with OLGA from my perspective – it didn't have much music from the bands I listened to. So, I decided to dedicate a portion of the web-accessible disk space allotted to me by UNCC to host a site like OLGA, but dedicated to contemporary Christian music (CCM). And with just a handful of transcriptions I'd done myself (and also submitted to OLGA for inclusion there), and some severely lacking website design skills, I began the CCM Guitar Music Archives.